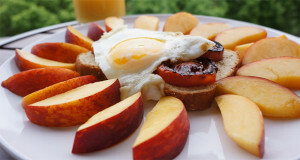 A hearty breakfast is mandatory when you’re camping. Especially if you’re going to be out hiking or on the water all day. 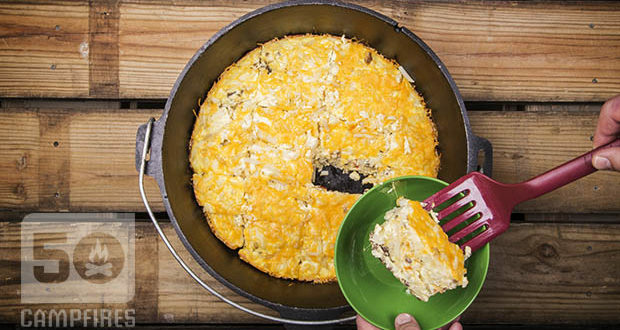 These sausage and hash brown dutch oven breakfast bars are just that. 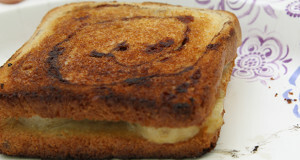 It is always a hit when camping and is pretty easy to make! I always like recipes that I can do some prep work at home to give me more time to relax while camping. 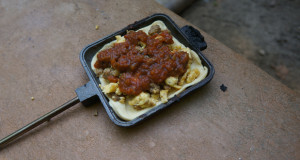 These dutch oven breakfast bars allow you to cut up all your vegetables and even pre cook your sausage and bacon if you would like. 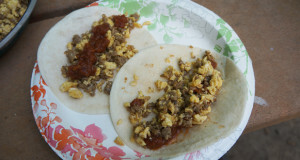 It does make a lot of food, so if it is just my family camping I cut the recipe in half. 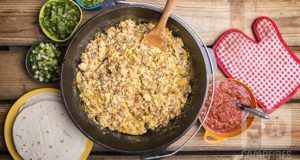 There are a lot of variations of breakfast skillets and casseroles but we were happy to find this recipe from Camp Chef, that puts all that goodness in to more of a bar form. 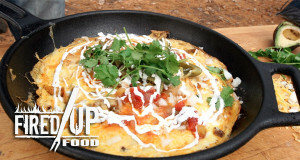 We adapted the recipe a little, deciding that we didn’t need the bacon or green onions. 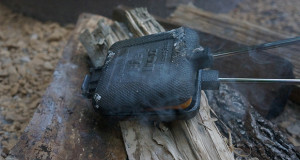 Sometimes keeping it a little more simple while camping is key. Add the sausage and ¼ of the onion into the Dutch oven, cook on at 375 degrees for 20 minutes or until sausage is browned. In a separate bowl mix all the eggs, cream of mushroom soup and milk. Add salt, the rest of the onion, and red pepper. Take the sausage and onion mixture from the Dutch oven. Take ½ of the sausage and layer the bottom of the Dutch oven. 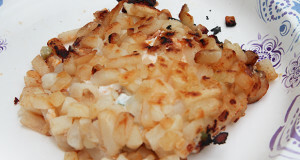 Next layer a ¼ bag of hash browns. 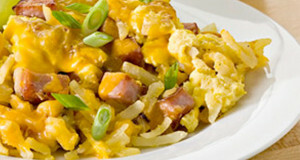 Pour the egg mixture over the hash browns and meat layer and sprinkle 2 handfuls of cheese on top of the egg mixture. Add the remaining amount of sausage, onion, and bacon for this layer. 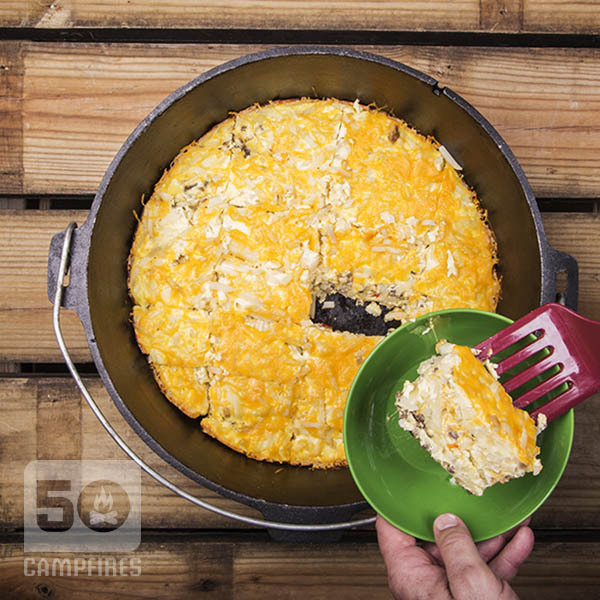 Layer the remaining amount of hashbrowns on top, place the lid on the Dutch oven, and bake at 350 degrees for 45 minutes or until the eggs are cooked. 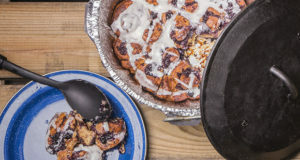 Take the Dutch oven from the oven and remove the lid. Layer again with cheese. Cover for a few minutes until the cheese melts. Remove, let cool and slice!